It's one of the lesser-known facts about Ireland's outdoor adventure scene that we have no less than four world-class mountain bike trail centres (Dublin, Wicklow, Limerick and Galway) and a further two in the works (in Sligo and Laois/Offaly). But it seems that when it comes to recreational mountain biking it can't just be a case of 'if you build it, they will come'. As well as access to the right equipment, some training how to ride these trails safely - some of which are very fast and technical - can really help visitors make the most of their off-road adventures on two wheels. That's what Niall Davis and his wife Tarja Owens of Biking.ie learnt when they spent three years doing mountain biking tours at Lake Garda in Italy. The Wicklow couple, who are legends in the Irish mountain biking scene thanks to years participating in top-level competitions like the World championships and the Olympics, had done a race season there and were blown away by the buzz of the recreational side of the sport. "What was going on there was just incredible, the volume of mountain bike-specific tourism that was there... a real eye opener," said Davis. In popular mountain destinations like Lake Garda, the idea of taking a mountain bike lesson if you're new to the sport - much like you would take a skiing lesson before you started skiing on your own - had long been part of the culture, Davis says. So in 2007 they trained in the UK as mountain bike tour guides and went back over every summer season (ie April to September) for the next three years, basing themselves in the northern part of Lake Garda and teaming up with a local hotel, getting to know the best trails in the Alps, as well as the local lingo. "We kind of just got inspired by that and every time we came home we could see that it was ready to kick off here and that there was nothing in place in Ireland, so we just found ourselves in the right place at the right time," said Davis, who hails from Glencullen, while Owens is from Delgany. "We had our qualifications. We had the experience. We knew the trends, the way it was going in the UK and mainland Europe." So in 2011 they approached Coillte, the commercial forestry agency that had just built the first trail centre at Ballinastoe in Co Wicklow, and successfully pitched to provide their services as mountain bike guides, trainers and bike hire suppliers. The couple rented a house close to the Ballinastoe Trail and which remains the company's headquarters today. In the early days they would have rented out 10-15 bikes in Wicklow, but on a typical busy day during the summer peak season, they would now lend out up to 50, and that's just at one centre. Biking.ie now has bases in Ticknock in Dublin, Ballyhoura in Limerick and has plans to set up in the new trail centre planned for the Slieve Bloom mountain region that strides both Laois and Offaly. But in order to keep the money coming in during the quieter times of the year, they have also gradually broadened their on-trail services into bike cleaning and repair, and cafes for tea and coffee and refreshments. "If you take somewhere like Ticknock; when we originally set it up it was just like a large bike shed, but when we took a step back and you looked at the potential market that was passing the door in terms of the number of walkers and families that were up there, we knew we had to try and maximize what we could and so it was a no brainer to try and make it a bit softer, more welcoming." Biking.ie employs four people full-time plus up to another eight to 12 on a part-time basis during the summer seasons. Having spent many years as a serious competitor in the sport, it was a natural move for Davis to set up more mountain biking events in a bid to help put the sport on the map in this country. To date, he has brought the European Mountain Bike Marathon championships to Ireland in 2014 - the first UCI-sanctioned mountain biking event her - as well as three consecutive years of the Enduro World series. As well as the benefit they brought to local economies, "the legacy that they leave in terms of becoming an iconic mountain bike destination is incredible because you're compared to the likes of Whistler in Canada and the Rockies in the States and Queenstown in New Zealand, so mountain biking is getting exposure around the world", says Davis. "We're at the right time now to attract that overseas market and to get going on what we started, which was bringing in people and and and showing them what we have here." Another series is a beginner-oriented MTB event called Biking Blitz, now in it's eighth year and hugely popular with riders of all ages and abilities. It's also sponsored by Coillte, which is a measure of how far the mutually beneficial relationship between the agency and the mountain biking scene has developed. "I think when we went to Coillte originally in 2010, I don't think they really knew what to make of the mountain bike thing then. They were very much kind of dipping their toe in the water [with Ballinastoe] and it was kind of a feeling that this would be the one mountain bike trail." The perception of the sport was also that it was a little anti-social in parts, so "it was up to us to try and reassure Coillte that what we were doing was different, that it was best practice, following what was being done abroad". Biking.ie's core customer base is mainly folks in their 40s who come along predominantly at weekends, but they're also catering for families and young people through events like the Blitz series. 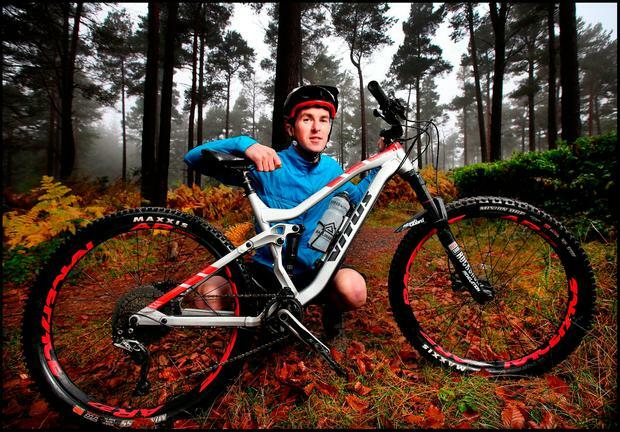 Davis, now 32 and a father of two young children with Owens (who now works as an osteopath), has stepped back from the day to day side of the business to focus on consultancy, mainly in terms of designing and building new trails for Coillte, but also on future events. Like many entrepreneurs who started off by dint of finding themselves at the right place at the right time, Davis has built up the business in a classically organic fashion, starting with the funds he and Owens generated during their tour guide exploits in Lake Garda. "We started off with half a dozen bikes which we bought from some money generated from the lessons, and then we just kept reinvesting. We then just got to a point where we had some steady income through the rental fleet, kept building on that side of things and it's just been step by step the whole time." Being passionate about the outdoors, he says the business "is a beautiful thing to be involved in", and serviced by a team who together have created a "good energy". "We're very lucky, we'll never make millions out of it but we've managed to sustain ourselves and create a few jobs." And as the market has grown, Biking.ie is now seeing more and more competition, which he welcomes. "You think you're doing the most you can until somebody comes along maybe replicates what you're doing and you've got to move up the ladder and you've got to keep improving."